"Hammock Details" Hammock 8ft 91in (L) x 2.8ft 33.5in (W). Unfolded size:94.5 x 47.2 inch excluding Nautical Rope & Carabiner Length. Straps 6.6ft (L) x 1.0in (W).Weight-hammock 16.9oz, Straps 2.1oz, carabiner 1.4oz weight capacity:max.440 pounds. "Large siza-packs down Small" Perfect to Camping, hiking, backpacking, travel, Emergency Survival and any adventures!Takes a few minutes to Setup and packs Away in a conveniently Small Integrated Stuff Sack for anyone on the go. "100% Lifetime Guarantee" so your t have to wonder if I am risking your hard-earned money. If you don t love it just let us know. We-ll make sure I a full REFUND, NO QUESTIONS asked!We take great pride at taking care of our awesome customers. COVACURE have changed the game and created a Camping Hammock with Mosquito Net – the most stylish travel hammock. – Good Quality – The hammock is made of super strong 210T parachute nylon material. This soft, breathable will last for a long lifetime. – Setup Fast And Easy – Our package includes hammock straps and carabiners for easy setup. It will take less than 3 minutes. – We have employed high-grade nylon triple interlocked stitches to maximize hammock strength for your ultimate safety. 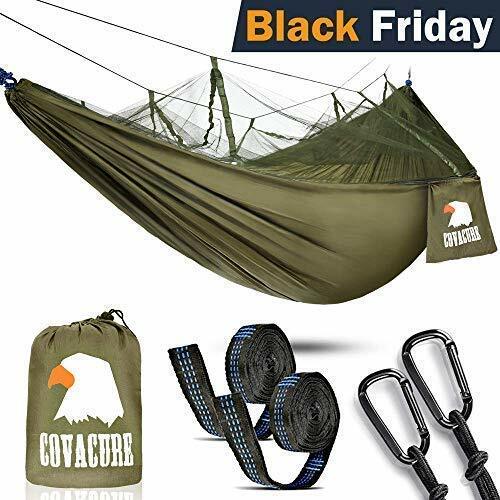 The hammock are tested to hold up to 440lbs – This makes the best hammocks ever using the high density polyester mosquito net which prevents mosquitoes flying into the hammock – COVACURE give you the best camping hammock. Compare to the other hammocks, our portable hammock is extremely SOFT and Comfortable.